A friend of mine in LiveJournal land pointed me towards this sweet rubbery confection. It is part of the Horror Flix Mutant Gummy Creatures line along with “Attack of the Giant Centipede” and “Revenge of the Giant Earthworm,” and all three are available at Walgreens. Need I say more? What could be better? Pictured in the wild on the lovely legs of Theremina, co-founder of my favorite blog EVAR, Coilhouse. 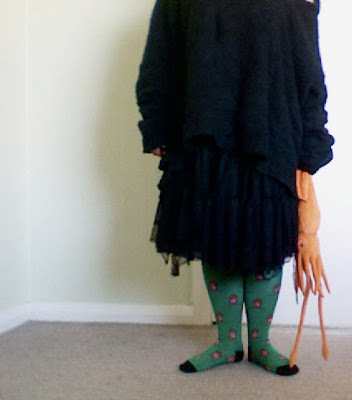 Note also her squidly plushy friend. Here's a close-up of Clicky, the Pixel Squid. Get your own from the Diesel Sweeties Pixel Socks collection, designed and made by rstevens in collaboration with Sock it To Me out of Portland. 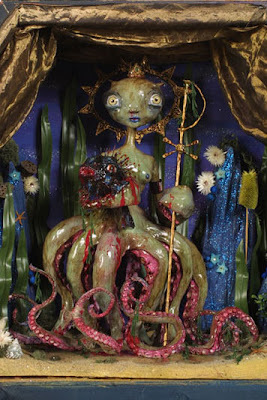 I have much love for the bizarre and otherworldly dioramas of LA underground artist Elizabeth McGrath. And this may be one of my favorites... The Sailor's Valentine, from 2001. Read more about the amazing Bloodbath McGrath in this feature on my blog. She's chock full of creepy goodness. Sorry for the late posting, compiling the list and drawing the names happened later then I expected yesterday. Sara wins the pirate print! Thanks to everyone who entered, and to everyone who posted cool links, drawings, and especially to those of you who told us what your favorite past posts have been. Its always interesting to find out what our readers like best! Soon we shall make a post showing off all the art you sent us, but I felt that it should have its very own post, outside of the results, to really properly show off all your excellent works. Sent in by Darien, its a real thing people. You can really go buy a tool that turns your hotdogs into octopi! To be fair, this really needs no further explanation. Yum. Some of you may recall, that upon reaching our 50th 'follower' we held a contest. Its time again for us to bring out the prizes and offer up a chance at winning through simple participation! Entry is simple, and there are multiple ways to enter. For completing each qualification you will receive the ethereal internet equivalent of 1 raffle ticket, the more tickets, the greater your chance of winning! 1) Comment here, in response to this post. Tell us your favorite Cephalopod and why. You may be as general (the cuttlefish) or as specific (Enteroctopus dofleini - the Giant North Pacific Octopus) as you want. You are not even restricted to living things, its possibly you have a stuffed octopus named Harvey who is your very favorite cephalopod ever and we're okay with that too! But you MUST tell us WHY it is your favorite! 2) Draw us something! It does not matter if you are Da Vinci or someone's three year old neice, if you draw with finger paint or photoshop, and there will be no judgement rendered upon art, only happy cheers of joy that you care. Just like last time, we will feature any art we receive in a blog post here. 3) Tell us what your favorite post we've ever made was. Maybe you got an idea, or learned something new or went out and bought something. Maybe you just thought that one time when we posted that youtube video was really awesome. Just tell us about it! Please note (and this is important) - if your email is not in your profile (the one we can get to by clicking on your name in the comment box) then please include it in your comment! We MUST have a way to contact you or you might not get your prize. The contest will run through Monday Nov. 9th. Prize drawing will take place the following day. Prizes will be added and updated during the course of the week! 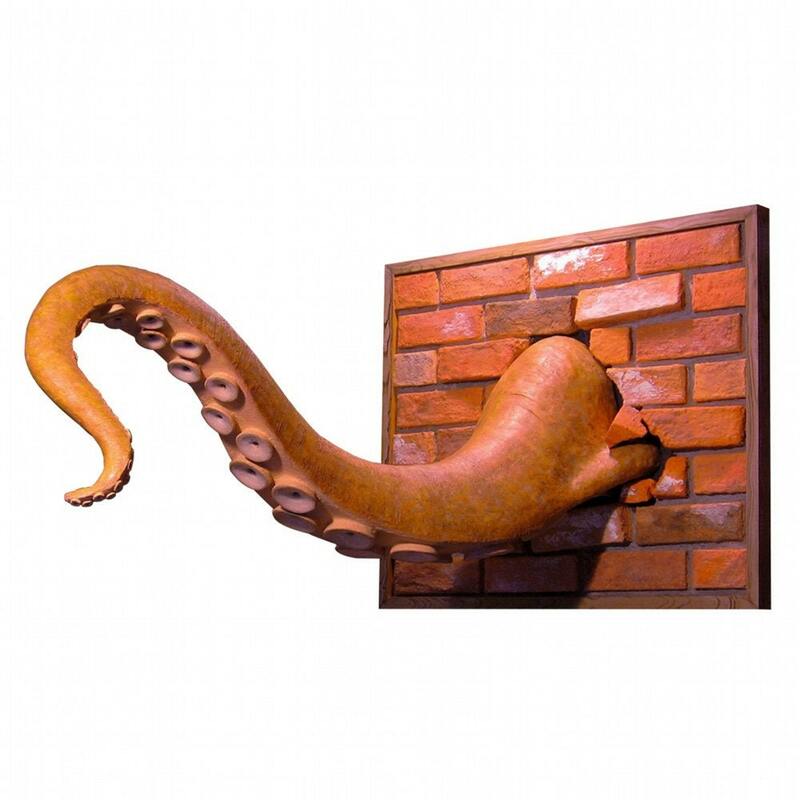 Each pin is cast from an original twisty tentacle sculpture by Sarah Dungan, in cold cast bronze. Antiqued and buffed to bring out the details in all those little suckers. Gentlemen, you may request they arrive as a tie-tack instead! 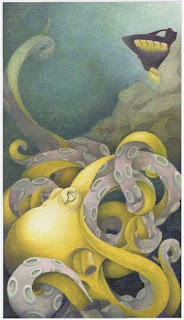 ADDED: prize number 3, pirate and tentacles mini print. 8.5 X 5.5 inch print of a pirate ship and its eventual DOOM! "I am actually quite happy with how they look and I think they are the most wild pair of goggles I have made. reaching tentacles and sharpened teeth hold the lenses permanently in place. The green and copper accents are painted with an inky wash that bring out the scarred and wrinkled skin texture. I hope that this pair brings a few unsettling looks from guests at the Museum." These goggles, along with a large variety of other fantastic steampunk devices and inventions are on display at the Museum of the History of Science, in Oxford. Anyone in the area should definitely swing by and check it out! Some of you, our dear readers, may remember that we ran a little contest upon reaching the exciting landmark of 50 followers. Well now we rest upon the cusp of an even greater moment, we are but a carpool away from reaching 100 followers. Having learned my lesson, I now fully expect you to recruit 4 friends within the next 6 hours or so. This time we welcome prize donations from anyone around who has something they'd like to offer. But regardless, there will be some little tentacle pins up for grabs, along with some other cool prizes. So, the race to 100 begins NOW! UPDATE: Thanks everyone! I knew you could pester your friends to do things quickly ;-) The contest will start tomorrow. This time prizes will be added throughout the week as more and more people enter, just to keep things exciting. Made by Liz of R Honey Pots, its just what you need to have a cephalopod tea party! Check out Liz's gallery for some other tentacled tableware including plates and mugs. And once again our squid hats are off to R Honey Pots for making the extra effort to include some less popular cephalopods - we know octopi are awesome folks but squid, cuttlefish and nautilus need some attention too! Kraken Rum - myth or monster? There has been some buzz lately on the interwebs regarding this particular up and coming beverage. But it remains somewhat ellusive. You can read up on the kraken (and the rum) on its website where you can also watch some informative films about kraken legend and biology. Yet, the store locator appears to be defunct. You can see some lovely photos of its equally lovely packaging over at notcot.com, more photos infact then are actually on the rum's own website. But where can you buy it? The collective consciousness of the internet does not seem to know! Rest assured the moment it can be obtained, this correspondent will give you a review of more then just its packaging! Oh how the internet has corrupted us. Had I merely taken my phone and called the nearest seller of fine beverages I might have discovered immediately that they have Kraken Rum on their shelves at this very moment. Gentle readers, soon you shall have you proper rum review! 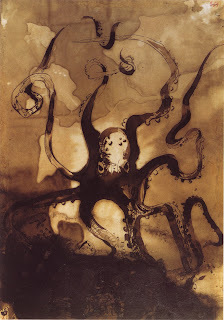 Victor Hugo's Octopus, Bearing the Initials V. H.
Most people know about that giant art festival in the desert. But did you know there's a miniature version called Balsa Man that happens annually on the same night? Not only do they burn a tiny man, they give tiny art grants for tiny art projects, on a scale of one to twenty dollars. 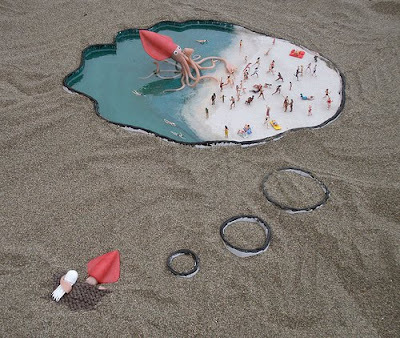 One of this year's prize-winners was called Squid Dreams. Check out Justina's photo stream on Flickr for her sculptural web comic Articulate Matter, which is largely based on various squid adventures - and check out the Balsa Man Web site, a hilarious send-up of the larger event, with detailed documentation and rules like the photo policy, which claims rights to all thumbnails of event. You can also see more fun Balsa Man pictures here. And you can purchase original sculptures and prints of Justina's work from her Etsy shop. So precious. Sweet squidly dreams! Swiped from Etsy.com's from page, check out Fleather's gold plated gem set eyed octopus rings! These rings are from the shop's 'Rabidfox' line of jewelry (which features a few more cephalopod creations including one very large Tentacle). The line is cocreated by Linda Smyth and Rebecca Pulver, and devoted to the animal kingdom in general. In her Wunderkammer shop on Etsy, jpolka offers crochet patterns for just about every cephalopod you can think of, and some other sea life as well. Anyone handy with a crochet hook should hop over and check them out, who can resist a big plush cuttlefish? And if something simple and...free...is more your speed, check out her blog for a lovely pattern for a teeny tiny little octopus! 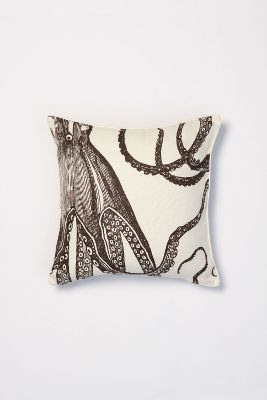 There are many reasons to love Anthropologie (although I can never afford anything there)... and I found another one today: this reversible linen octopus pillow by Thomas Paul. 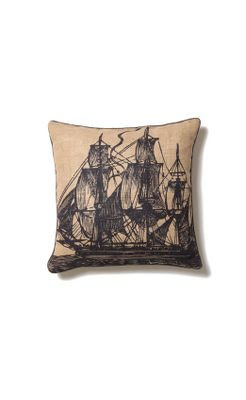 It's got the same design on the back side in reverse, and there are whale pillows, tall ship pillows and anchor pillows in the same style to complete your nautically-themed couch. If I had $118 to spend on a pillow, it would surely be this one. What safer way to store your files then...in a squid? Sarai0989 makes and sells darling little felt USB jump drive covers in her Etsy shop. Available with or without a USB drive inside. 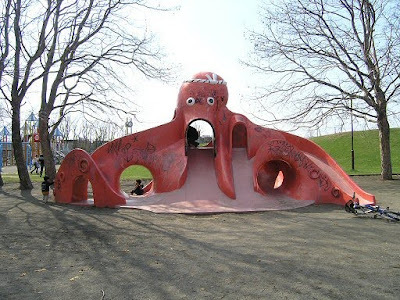 Japanese cephalopod-inspired playground structures! See more here. 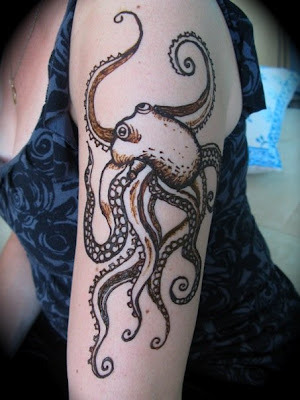 My friend Darcy Vasudev is a brilliantly talented henna artiste... behold this amazing henna tattoo of an octopus she did for a very hip customer. Check out more of Darcy's work at her Web site Henna Lounge, or on her Flickr page. The power of Cthulhu is awakened in a small midwestern town by a couple of bored teens and a library book from the restricted section. While everyone's favorite cephalopod-diety is more an omnipresent power then a character - the artist Fiona Staples slips a tentacle into the layout now and then, to remind you who is really in control of the situation. Its written by Aaron Williams and running for 6 issues. If you go and buy them, maybe it will run for more! This post is dedicated to our 'arch-nemesis' Canadian Cave of Coolness. This proves nothing CCoC...nothing. 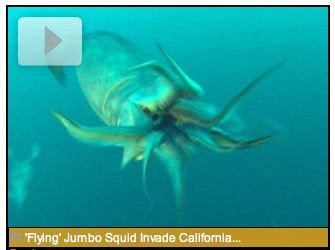 Talk about morphing - a 600 pound octopus shape-shift itself to wriggle through a passageway the size of a quarter! More gorgeous work from Etsy's Mary's Treacle, this time an albino octopus cameo necklace with antiqued brass chain and lobster claw clasp. From the shop description: The cameo was made by using a tiny print of my original illustration done in gouache. I backed it in wood veneer then covered it in Resin to protect it. Artist Mary Louise offers free shipping on all Treacle jewelry. Visit her blog, The Sticky Vat, here. 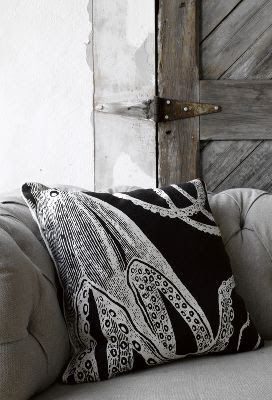 As follow up to the angry cuttlefish prints, continuing to express our love for hand printed cards and art, we present Michelle's Octopus print. You can purchase him and other paper goods at her Etsy shop Little Paper Dog. I've been a very negligent contributor here for the past few months, I admit ~ my whirlwind of a life gets in the way too often. But here's an offering that will make up for my lack of octo-love-gathering. 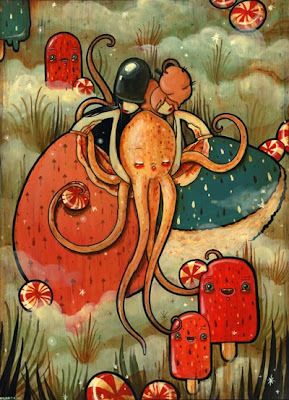 There are myriad reasons to love LA pop surrealist artist Brandi Milne, but her brilliant paintings of tentacled sea creatures are what I'm excited about today. 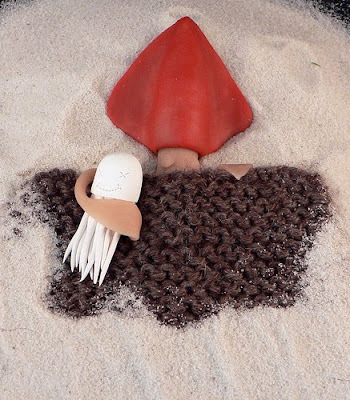 Brandi's work is amazing to me - cartoonish, yet elegant, childlike and playful, yet dark. I get lost in her saturated, dripping world of candy and decay, and I like it. 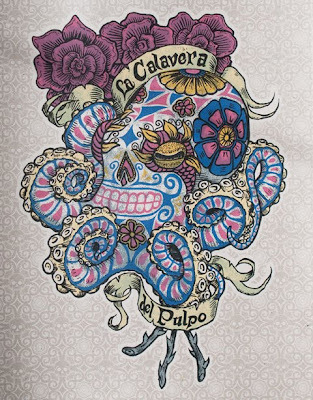 You can even get her brilliant artwork on a sticker for your iPod or laptop through the fabulous Gelaskins! 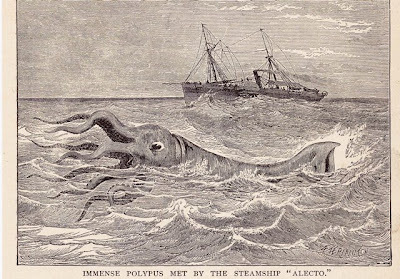 Immense Polypus Met By The Steamship "Alecto" is an amazing steel-engraved plate from the SurrenderDorothy Library of Natural Wonders on Etsy. From the item description: The stunningly detailed and totally wonderful captioned plate was found hidden away by a good friend & long-time serious collector of classically beautiful Victorian engravings. Jane E. Roberti creates these fabulous pieces of metal piercing in her studio in Chicago, and sells them in her Etsy Shop. Our squid hats are doffed to her for including squids as well as the ever popular Octopi in her collection! 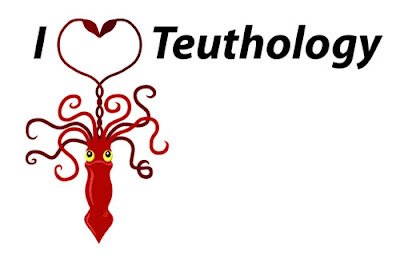 I Love Teuthology wearables on Neatorama: Giant squids, the only known predators of sperm whales, are strange and mysterious creatures that have captured sailors' wild imagination since humans first forays into the ocean. If you are as fascinated with Kraken as we are or love reading "Twenty Thousand Leagues Under the Sea" - not to mention if you actually study teuthology (yes, that's the study of cephalopods), then this is the perfect T-shirt for you. 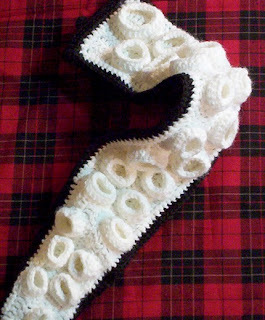 It's never to early to start planning for the holidays, and Etsy seller creeplings has just the thing in their shop: Tentacle Stockings, crocheted wonders of the deep. Handcrafted from the finest 100% acrylic yarn, this Tentacle is perfect for filling with a multitude of little gifts and candy. Holiday Tentacle Stockings come in a variety of deep-sea colors. This one has a white front and a black back with white pinstripes. There are so many creative people out there. First a recycled chopstick octopus sculpture, now a knitted from recycled electrical wire octopus! John Binet-Fauvel, of Wales, creates his sculptures from wire recycled defunct electrical appliances, making a bendable, posable, knitted piece. You can see more sculptures in his Etsy Shop. The discovery resolves a century-long debate over whether cephalopods, the group of sea creatures that includes octopus, squid, cuttlefish and nautiluses, can hear sounds underwater. Compared to fish, octopus and squid do not appear to hear particularly well. But the fact they can hear raises the possibility that these intelligent animals may use sound to catch prey, communicate with one another or listen out for predators. The question of whether cephalopods can perceive sound has been controversial since the early 20th Century. Some experiments suggested that blind octopus seemed able to locate the sounds produced by boats or by tapping on the outside of a tank. But most cephalopods lack a gas-filled chamber, such as the swim bladders that fish can use to hear. That suggested they could not detect the pressure wave component of sound. 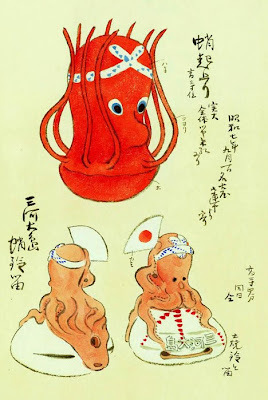 However, sensory physiologist Hong Young Yan of the Taiwan National Academy of Science in Taipei, Taiwan suspected that octopus and squid might use another organ called the statocyst to register sound. The statocyst is a sac-like structure containing a mineralised mass and sensitive hairs. Fish also use it to detect sounds, and in previous research, Yan showed that prawns can use their statocysts to hear. "So we extended our work from prawns to cephalopods," says Yan. 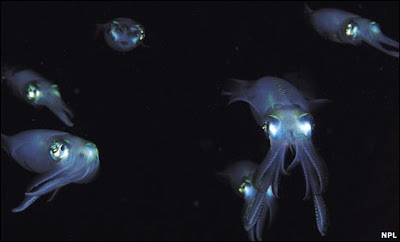 Yan's team tested the auditory capabilities of two species, the Common octopus Octopus vulgaris and the squid Sepioteuthis lessoniana, often called the Bigfin reef squid. They discovered that the octopus can hear sounds between 400Hz and 1000Hz. The squid can hear an wider range of sound from 400Hz to 1500Hz, they report in Comparative Biochemistry and Physiology, Part A. "That indicates that squid have a better hearing capability than the octopus," says Yan. "Interestingly though, both species hear best at a frequency of 600Hz." 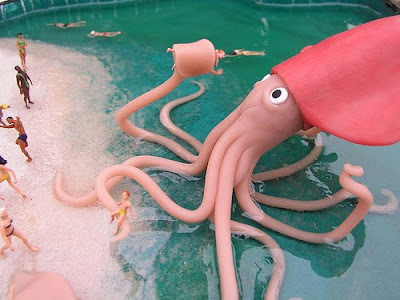 Yan's team had to overcome particular technical challenges to investigate the cephalopods' hearing ability. The usual way to prove that an organism can hear is to measure how its nervous system electrically responds to sound. But that can involve directly attaching electrodes to exposed nerves, an invasive procedure that could harm delicate cephalopods. So Yan invented a non-invasive method, which involves placing electrodes on an animal's body to measure the electrical activity in its brain. 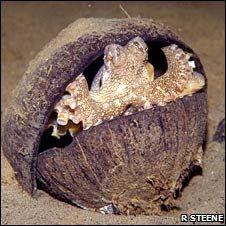 In this way, he could measure within just a couple of hours whether the brain of an octopus or squid responds to sound. The discovery could open up a new understanding of cephalopod behaviour. "The key question which I would like to investigate is what kind of sounds are they listening to?" says Yan. "Perhaps they listen to sound to evade predators and can eavesdrop to sounds made by their prey. 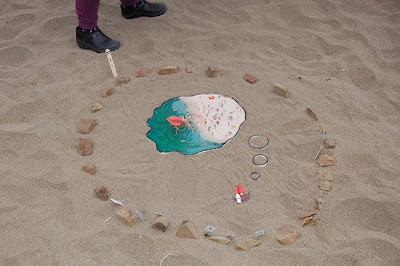 Or, perhaps they even could make sounds to communicate among themselves." 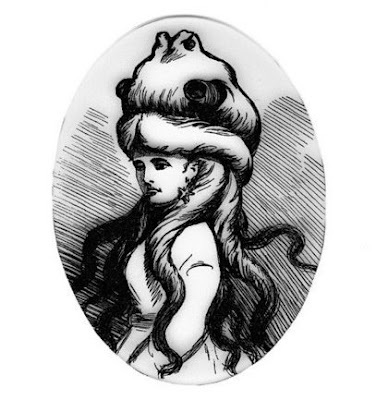 Paraphernalia's new Portrait Collection of brooches features beautiful vintage illustrations of Ladies sporting particular sartorial choices. Paraphernalia designs beauteous and wholesome adornments for both Ladies and Gentlemen, inspired by both vintage illustrations and 19th century magicians. 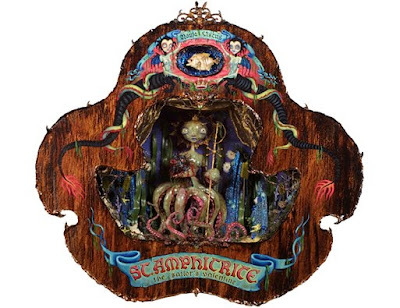 Their work celebrates the odd, unusual, uncanny and bizarre. Ms. Dina is a young Greek heiress raised to the highest standards, although she refuses to behave as a proper lady. She can instead be found exploring the deep caves and crevices under the sea that watched her being born. Find her here. Sacramento-based artist Char Hall is available for custom tattoo design and inking through Side Show Studios. Be sure to check out the other enchanting creatures Char creates here as well.